1. Mix oats and walnuts in 13 x 9 inch baking pan. 2. Combine ¼ cup of the maple syrup and butter in small heavy saucepan. Bring to boil. 3. Pour maple syrup mixture over oat mixture; stir to blend well. Bake 10 minutes at 375 F, stirring occasionally. Continue to bake until mixture is golden and crisp, stirring occasionally, about 8 minutes longer. Cool granola completely in pan. (Can be prepared 1 week ahead. Store in airtight container at room temperature). 4. Gently toss strawberries, kiwifruit and remaining maple syrup in large bowl to blend. 5. Divide half of the fruit mixture among 6 parfait or wine glasses. 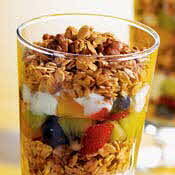 Sprinkle each parfait with half the granola mixture, dividing equally. Top each with half the yogurt. Repeat layers.